In May 2016, the Government of India unveiled the ‘The Geospatial Information Regulation Bill 2016’ in order to “regulate the acquisition, dissemination, publication and distribution of geospatial information of India which is likely to affect the security, sovereignty and integrity of India.”1 According to the bill: “Whoever disseminates, publishes or distributes any geospatial information of India in contravention of section 4, shall be punished with a fine ranging from Rs. 10 lakhs to Rs. 100 crore and/or imprisonment for a period up to seven years.”2 Further, for such dissemination or publication or distribution of geospatial information of India outside India were to occur, a hefty fine “ranging from Rs. 1 crore to Rs. 100 crore and/or imprisonment for a period up to seven years” is proposed.3 Once enacted as law, the proposed bill will make it mandatory to obtain permission from a government authority before acquiring, disseminating, publishing or distributing any geospatial information of India including the cartographic depiction of J&K. The proposed legislation caused considerable domestic opposition, which threw into question its feasibility and future prospects. Even as the domestic debate was shaping up, India-Pakistan bilateral atmospherics were fuelled by this new “stress-point”.4 Pakistan raised the ante against the proposed Indian legislation by invoking the issue at the United Nations. 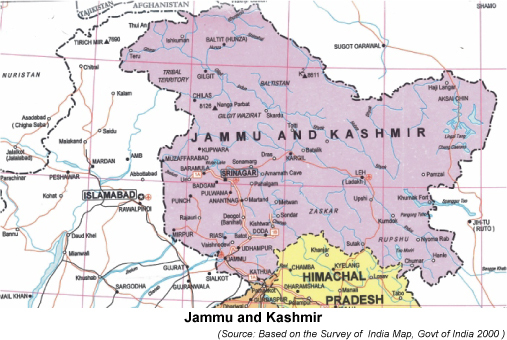 It alleged that “the official map of India has been depicting the disputed territory of Jammu and Kashmir as part of India which is factually incorrect and legally untenable.”5 Terming the legislation as a violation of international law, Pakistan’s note to the UN General Secretary urged the holding of a plebiscite to determine the future of J&K. India’s response was one of downright rejection and questioning of Pakistan’s locus standi for challenging a domestic legislation within India. Interestingly, about two years ago in May 2014, Pakistan’s National Assembly had passed a similar bill “The Surveying and Mapping Act”, to regulate geospatial data and designated the Survey of Pakistan as the nodal agency in this regard. The Survey of Pakistan map shows J&K (within India) as part of Pakistan, captioned “disputed” however. But it does not include the Aksai Chin area.6 India is not known to have objected to either Pakistan’s geospatial legislation or its official map.7 In February 2015, exercising the powers conferred by the above act, Pakistan’s federal government came out with Surveying and Mapping Rules 2015, which was published in the Gazette of Pakistan in March 2015. In the light of the Indian geospatial legislation, the amount of political capital attached to it domestically and, more significantly, Pakistan’s objections to it, this policy brief avers that India needs to extend the ambit of its official claim on PoK beyond mere cartographic assertion. In the emerging geopolitical environment, the cartographic inclusion of areas that legitimately form part of India, i.e., the entire erstwhile princely state of J&K, needs to be taken up in a forthright manner as a policy measure to seriously establish India’s claims on PoK. Calculated pro-activism on PoK could bolster India’s position on Kashmir both in formal negotiations as well as backchannels talks. Key developments in India’s close proximity augur compounding geopolitical challenges. The strategic bonding between Beijing and Islamabad is expanding into the economic realm through the extensive connectivity corridor to be built across PoK, which throws into starker relief China’s growing commitment to and presence in Pakistan. Concurrently, the recent spurt in violence in J&K has amplified the gravity of the situation. It is well known that the problem of J&K has reached this level because of unstinted and unabated Pakistani support to the separatist constituency over the years. Pakistan’s support has catalysed the situation and kept the issue on the boil. The internal politics within J&K has not been too encouraging all these years to ward off such persisting Pakistani machinations. This does not bode well for both India and the Kashmiris. India has dealt with Pakistan’s obsession with Kashmir for decades. However, despite Pakistan’s weak claims on Kashmir, it has managed to whip up popular sentiment against the Indian state, on the one hand, and the popular political leadership in Kashmir, on the other. The energy and verve with which Pakistan has successfully sustained its propaganda on Kashmir for decades has been complemented by lack of foresight and adaptation to changing circumstances on the part of policy makers in India. While India continues to weather Pakistan’s asymmetric assaults rather tamely, it needs to be bold and innovative in its approach, and reassert its genuine claim on PoK rather than adopt a defensive stand. Claiming PoK can potentially be an antidote to Pakistan’s unfounded but aggressive claim on Kashmir. Additionally, rebooting the claim on PoK can reinforce India’s position against the China-Pakistan strategic and economic partnership (involving PoK) in the near and long terms. A rethink involving the raising of the PoK issue can be effective when India sets out recalibrating its political and strategic measures to safeguard its core geopolitical interests vis a vis Pakistan and China. Ever since the Maharaja of Jammu and Kashmir State signed the Instrument of Accession, India’s position on J&K, and on PoK in particular, has remained largely unaltered. The Indian position on PoK has been articulated intermittently, but in a rather mild way. India’s claims on PoK have not been as strident as it ought to have been. True, the Parliamentary Resolution of 1994 was an emphatic re-statement of India’s position on PoK, urging Pakistan to vacate areas under its illegal control. But such assertions have not been backed by astute and assertive repositioning at the diplomatic and policy-making levels, leading to the general impression that India is resigned to the idea of losing the territory to Pakistan and settling for the Line of Control as the border. Re-calibrating the Indian approach towards PoK will require shedding policy hesitation on PoK, minimizing contradictions and addressing gaps in policy pronouncements. This may require an overhaul involving a multi-stage strategy to shift the discourse on PoK from the cartographic domain to the policy domain. To begin with, the following measures could be considered for implementation in the domestic, external and ancillary levels. A purposeful strategy on PoK will require a certain basic course correction — one that situates the region in the popular imagination in India and bridges the knowledge gap in the country about a region which legally belongs to it. In the absence of a concerted course correction, no breakthrough on formulating an ambitious and focussed strategy on PoK will be possible. The primary goal here should be to alter domestic perceptions and political complacency on PoK. A white paper on PoK: In a vibrant democracy like India, where minute issues are open to intense debate and public scrutiny, the twin issues of J&K and territorial integrity enjoy multi-partisan support across the entire political spectrum. The Government of India needs to capitalise on this consensus by bringing out a white paper that delineates India’s position on PoK in the light of developments that have occurred in the last few decades or more. It has been nearly 22 years since the Parliamentary Resolution of 1994 was passed and there has been no detailed point of reference to ascertain India’s official claim on the PoK region since then. Meanwhile, statements from the concerned ministries in the government or default allusions to PoK have been rather sketchy, tepid, and at best, reactive. To enhance the vigour and substance of its claim, India needs to cogently argue out its position on PoK by putting out a comprehensive official document/proclamation in the form of a white paper that is mindful of contemporary challenges and geopolitical fundamentals. 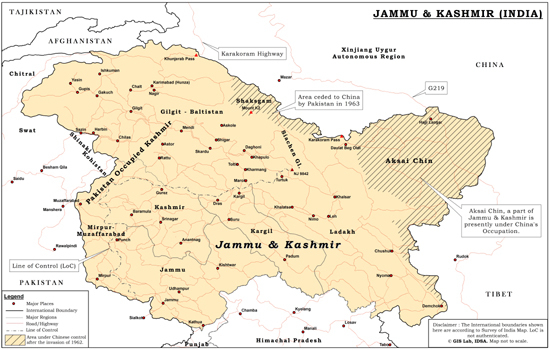 Constitutional measures: Part VI Section 48 of the Constitution of Jammu and Kashmir carries a provision of 24 seats in the state’s legislative assembly for representatives from PoK. This section notes that such seats shall lay vacant “until the area of the State under the occupation of Pakistan ceases to be so occupied and the people residing in that area elect their representatives.”8 While no concrete effort could be made to fill these seats in the assembly, provisions to constitutionally supplement a similar quota of representation in the Union Parliament have not been accorded much significance. In December 2014, a private bill to this effect was rejected by the Parliamentary Committee.9 Before this, in October 2013, the government spurned media reports conjecturing a serious rethink on allocating seats for PoK in the Lok Sabha.10 It may be worthwhile to re-consider this option for effective policy posturing. Besides, an amendment to this effect would also address the element of incongruence between the constitution of J&K state and the constitution of India. Deft dispersal and administration of information: The government needs to disseminate information regarding PoK through the right channels. Compared to the level of public awareness in Pakistan on Kashmir, that of PoK within India is dismally low. Comprehensive information on the political status of PoK should be infused in the popular discourse in the Kashmir Valley as well. As acknowledged in a Home Ministry-aided study conducted in 2010, Kashmiri youth appear largely unaware of the politics and nature of governance in PoK.11 Systematic efforts to curb misperceptions regarding the notion of azadi on the other side, especially in the so-called AJK, would be much useful. Similarly, it is vital to initiate steps that could factually highlight Gilgit Baltistan’s sustained political exclusion by Pakistan. Concerted attempts should be made to fill the existing vacuum concerning PoK’s political ground realities. It is also intriguing that people in India know relatively more about the excesses committed by Pakistani forces in Balochistan than what Islamabad is actually doing in PoK. India’s inert policy behaviour is partially responsible for creating a situation where PoK invokes an uncertain ambiguous reaction amongst people at large despite the fact that they grow up used to the perpetual illustration of this region in the official map of India. Moreover, there is a large section of Indians that believes that India has virtually lost its claims on PoK. Besides, confusion still prevails on the geographical expanse of PoK. Several writings within India have more often than not referred to the so-called ‘AJK’ and PoK interchangeably, thus keeping Gilgit Baltistan away from the purview of India’s claim. Apart from maps, it is vital to undertake necessary measures to curtail the misrepresentation of facts related to PoK in the domestic public discourse. Media feeds: Indian media’s coverage of PoK has been rather scant, and lacks depth and understanding. Sporadic coverage of PoK in the Indian media — both electronic and print, as well as English language and vernacular — is reflective of the scale of importance that has been accorded to the region in the public discourse. The media tends to focus on issues that stir public sentiments. Unfortunately, because of decades of neglect and disinterestedness, PoK has lost its appeal as an Indian territory illegally occupied by Pakistan— a historical wrong that could not be set aright by the United Nations because the issue got enmeshed in Cold War politics. In an interesting departure from the past, in September-October 2015, a number of private news channels in India broadcast footage of gross human rights violations in PoK showing Pakistan’s highhandedness against those challenging its authority and control in these areas. Ensuing discussions were, however, rather poor and ill-researched. Media coverage on PoK has a tendency to quickly dissipate as they fail to generate the necessary traction in India. Apart from Asian News International (ANI), which regularly features short videos on PoK, especially Gilgit Baltistan, PoK remains one of those domains that has been grossly neglected by the Indian media. It is distressing to note the stark contrast between the Pakistani media’s obsession with Kashmir and the near complete apathy of the Indian media with respect to developments in PoK. It is hard to recall the last time a full-fledged op-ed focussing on PoK was published in any of the mainstream national dailies. Along with promoting comprehensive coverage in state-owned broadcasting channels, developments and issues related to PoK need to figure frequently in the media especially on the prime time slot of private news channels. Augmenting references to PoK in official statements and focussed discussions on the issues concerning the region will incentivise media coverage, providing the much-needed stimulus for enhanced popular awareness regarding PoK. Pakistan’s reaction to the recent spate of violence over the killing of Hizbul Mujahideen commander Burhan Wani on July 8 has been along expected lines. The statement from Pakistan’s Prime Minister Nawaz Sharif, the observation of a Black Day and a joint session of Parliament were all aimed at indicting the government of India for committing gross atrocities in J&K. There were instant rebuttals from India, urging Pakistan to set its own house in order with stray allusions to violations taking place in PoK and Balochistan. In such circumstances, it is important that India innovates and shifts the policy gear from being merely reactive to being decisively proactive. It is of no avail if statements on PoK are invariably issued in a reactive mode, more so to balance out Pakistan’s rhetoric. Pakistan is quick to capitalise on crisis situations in the Kashmir Valley and does not fail to seize the opportunity, in clear contrast to the indifference displayed on the Indian side which is reminded of PoK only upon some provocation from the other side. India needs to replace this approach with a more consistent, pre-emptive one so as to outmanoeuvre Pakistan’s relentless rhetoric-driven agenda on Kashmir. At a certain level, India’s geopolitical challenges vis-a-vis PoK involves China as well. While China may aver its neutrality on the Kashmir issue, it will continue to be a factor for India to reckon with. China is in possession of 2000 square miles of J&K territory in the Shaksgam Valley and has played a pivotal role in consolidating Pakistan’s hold over Gilgit-Baltistan. The Karakoram Highway was built through the disputed territory, despite India’s protests. China has unfailingly reminded India of the disputed status of Jammu & Kashmir by denying visas to Indian military officials deployed in that state and it has now officially registered its concern on the recent incidents. China’s statement noted that it was “concerned about the casualties in the clash, and hope that relevant incident will be handled properly. The Kashmir issue is left over from history. China holds a consistent stance and hopes relevant parties will address the issue peacefully through dialogue.”12 Alongside facts regarding China developing extensive stakes across PoK (including the massive China Pakistan Economic Corridor), the aforementioned official statement signals a perceptible change in China’s positon. So far, it had avoided reacting to India’s actions to counter Pakistan-backed subversion in the state. The China-Pakistan axis working together on the Kashmir issue has to be deftly handled. Bilateral assertion with Pakistan and China: For the reasons mentioned above, India needs to place PoK on the bilateral agenda with both Pakistan and China. While Pakistan is in illegitimate control of PoK, China’s unhindered involvement in the region despite India’s protests is a constant source of strategic concern. India needs to highlight how terrorist sanctuaries have proliferated in the entire PoK. Collective inputs from the intelligence agencies could be used to prepare a dossier on the militant training camps in PoK and disseminate them through relevant platforms, apart from handing it over bilaterally to Pakistan, the United States, China and other key countries at the most appropriate occasion. Hedge against Pakistan: The simmering political unrest in PoK has been understated and much less reported. For several years, a phenomenal growth in the number of nationalist or advocacy groups in the PoK region (especially in Gilgit Baltistan and also in the so-called AJK) has been witnessed. India needs to explore options to constructively engage with such political groups in PoK. Inputs from such groups would enable India to develop a better understanding of issues and concerns of the people and the land in this region. India also needs to chart out a well-thought-out policy framework designed to diminish the malicious propaganda and subversive activities unleashed by Pakistan. While India has ably handled Pakistan’s propaganda at the UN, it may be useful to consider citing PoK in rejoinders and pre-emptive remarks as well. So far, Pakistan has selectively quoted from the UNSC resolutions to corner India on the question of Kashmir. Pakistan’s stratagem could be deflated to a great extent by invoking the ‘demilitarization clause’ from the same UNSC resolutions, which required Pakistan to withdraw its forces completely from what is now being referred to as PoK. Additional routes on the Line of Control: In addition to the existing routes, India needs to consciously insist on opening up more points across the LoC for movement of people and goods, especially the Kargil- Skardu route. The proposed route has been on the anvil for long and involves the sentiments of people on both sides in the Ladakh-Gilgit Baltistan sector. With an initiative such as this, India is likely to generate goodwill on the other side of the LoC and in the process also bring forth Pakistan’s hesitations on such measures that seek to facilitate communication among the people on both sides of the LoC. Academic deliberations: In the wake of the ongoing turmoil in J&K, there emerged a critique regarding the stark gap in the holding of quality discussions on issues concerning J&K. Correspondingly, there is an utter lack of interest in developments in PoK— the election in the so-called AJK, for example, went literally unnoticed. Interestingly, the ‘AJK’ electorate voted overwhelmingly in favour of the Nawaz Sharif led PML-N (Pakistan Muslin League-Nawaz), which was at the receiving end of criticism for its openness to the idea of reconciliation with India. Regular discussions identifying the nuances in the local politics of ‘AJK’ and Gilgit-Baltistan in academic research institutions could be a good beginning. Similarly, proceedings from conferences and seminars on PoK could be effectively channelled into informing/educating policy circles. Open public discussions are quintessential for advancing the scale of domain awareness on PoK. It has to be borne in mind that optimal benefits from such discussions can be reaped only by engaging people from PoK. Nationalist constituencies in PoK need to be provided an appropriate forum for venting their views, thereby exposing Pakistan’s highhanded approach towards the region. While it may be difficult to process the visit of residents of PoK to India for conferences, hosting people from the PoK diaspora based in Europe and the United States for the purpose offers an easier option. Ideas exchange and research collaboration: Over the past few years, several PoK-centric think tanks have sprung up in the United States and Canada. Encouraging constructive engagement between PoK driven think-tanks, academics and communities with those in India will lead to cross-fertilization of ideas and forge partnership on significant issues of mutual interest. Institutions in India can also think in terms of incentivising young people from PoK (diaspora included) through educational and skill building exercises. India is passing through a critical phase of growth and development. However, the country still needs to overcome intractable domestic challenges to sustain the momentum in economic growth and prosperity. In this regard, the protracted problem of Kashmir as a principal challenge involving India’s all-weather adversary, Pakistan, is a perennial strategic distraction. India has no option but to conceive a well-thought out strategy to overcome this distraction. While measures to deal with discontent within are necessary, it is also important to chart innovative measures to undercut Pakistan’s gross indulgence in fanning the problem. Blueprinting a refined and robust approach on PoK is one of the key components in mapping India’s strategic adaptability/transition and preparedness for future contingencies. India must avoid policy incoherence and inconsistency on PoK that has spanned decades, and navigate a course that helps reshape the domestic as well as external discourses on PoK and pursue Indian claims in a firm, consistent manner. 1. “Draft of the “The Geospatial Information Regulation Bill, 2016,” p. 1, p.1. 4. Andrew Whitehead, “Map of Kashmir Creates New Pak-India Stress Point - But It Shouldn't,” NDTV, May 24, 2016. 5. “Pakistan expresses concern with UN over Indian move to violate UNSC Resolutions on Kashmir,” Ministry of Foreign Affairs, Government of Pakistan, May 17, 2016. 8. “The Constitution of Jammu and Kashmir,” pp. 16-17. 9. Raghvendra Rao, “House panel bars BJP MP’s Bill to create Lok Sabha seats in PoK,” The Indian Express, December 10, 2015. 10. “Home ministry denies plan to create Lok Sabha seats for PoK,” Live Mint, October 15, 2013. 11. Perception Survey of Media Impact on Kashmiri Youth, Main Report, Institute for Research on India and International Studies (IRIIS), pdf, p. 52. 12. “Foreign Ministry Spokesperson Lu Kang's Remarks,” Ministry of Foreign Affairs, Peoples Republic of China, July 18, 2016.